With half term approaching, it’s time for an update on some of the many events which our students have enjoyed over the past few weeks. Here are just a few of the highlights. Our Pipe Band, the largest school band south of the Border, visited Aysgarth School recently. We have Aysgarthians in our band, and this was an excellent opportunity to share expertise with the entire school. Our Pipe Major Bryan Robinson showed the boys how the pipes and drums actually work, and one particularly effective exercise featured 6 Aysgarth volunteers standing opposite our drummers with an extra set of sticks and trying to copy their actions as they played. Our students enjoyed a warm welcome and lunch in the refectory, with thanks to the Headmaster, Mr Morse and Director of Music Mr Atherton. Our annual Burns Night celebrations for the Sixth Form this year started with canapés served by the BTEC Hospitality students, whilst dance cards were populated. Fr Hugh shared some of the history of Robert Burns, and addressed the haggis, before a traditional meal of haggis, neeps, and tatties. Guests had been practicing reels for two weeks, and this made the night all the more enjoyable. We were delighted to welcome some keen young organists to Ampleforth this weekend for our first Organ Masterclass, led by our Director of Choral Music and Organist Will Dore assisted by our Assistant Organist, Tom Coxhead. The visiting students all show promise in their keyboard skills, and the day allowed them to develop their understanding of the organ and pick up some useful advice from Mr Dore. Two of his organ scholars from last year have won organ scholarships to Cambridge, and our visitors also had the opportunity to hear some of our current students play in a brief recital to finish proceedings. If you’re interested in music at Ampleforth you may like to know about our opportunity for gifted Strings players, who are invited to attend our forthcoming Strings Masterclass on Friday 29th March. For further details, please contact our Head of Strings, Nicola.Hicks@ampleforth.org.uk It will soon be time for the Spring Concert, and tickets are available here. The concert will feature the College Orchestra, Brass Ensemble, Pro Musica and Big Band. As a UCL Beacon School in Holocaust Education, Ampleforth organised a unique cross-curricular project for our Year 9 students centred on Holocaust Memorial Day. Every department dedicated one Year 9 lesson to looking at an aspect of the Holocaust from their subject's perspective, so that the students could get a deeper and broader understanding of the Holocaust. The lessons were truly inspiring and the work produced outstanding. They were a tribute to the teachers who spent much time devising the lessons and to all the students who engaged so enthusiastically with the project. The examples are too many and varied for all to be mentioned, but here is a snapshot. French and Spanish looked at wider European anti-Semitism, including the expulsion of the Jews from Spain in 1492, and also at the Spanish play 'Ultimo tren a Treblinka' about the heroic life of Janusz Korczak. In Liberalis, students explored the history and different strands of anti-Semitism and in Christian Theology and Latin, students looked at the massacres of Jews at Clifford's Tower in York in 1190 and at Masada in Judea in AD73. In English, students studied stories and poems about the Holocaust and wrote their own poems in personal response to what happened. In drama, students wrote their own monologues, again in personal response to the events and experiences of the Holocaust. In Art, students produced their own art work to reflect what happened. History looked at the huge variety of ways in which the Holocaust is memorialised in different countries. In Design and Technology, this was supplemented by a study of the design of the new British National Holocaust memorial to be built by the Houses of Parliament. Geography looked at the displacement of Jews from their countries of origin and also at genocides in other countries. Science looked at eugenics and the ‘science’ behind Nazi racial theory. It looked also at Nazi experiments in the camps and the ethics of whether their findings should be used today. In Information Technology, students looked at Nazi anti-Semitic propaganda and compared it to modern on-line propaganda and its potential to transmit hostile messages. Learning Support looked at some of the language of the Holocaust and some of the literature. In Drama, perhaps most impressively of all, students learned about the Kindertransport, looked at source materials, created their own role play and monologues, and reflected on what it must have been like for the children to have gone through such experiences. Scholars in mixed year groups discussed what makes a hero and who could be regarded as a hero, and why. Contemporary and historical (including Classical Greek) figures were looked at, both real and fictional. The nature of celebrity and sainthood was also discussed. Meanwhile, our Sixth Form scholars enjoyed their annual dinner. After the meal, the Year 13 students displayed some impressive knowledge and lateral thinking as they answered the general knowledge quiz set by the Year 12 scholars, and the Sixth Form music scholars performed for their audience. Ramsey Tawfick and Fergus Stainton competed in the North of England regional round of the Oxford Schools’ debating competition, held at St Peter’s School in York. This involved debating two motions over the course of the evening, with only 15 minutes of preparation for each, known as ‘short prep’. Ramsey and Fergus proposed the motions: ‘This House would pan private schools’ (appreciating the irony), and ‘This House would recast iconic roles with BME actors.’ Ramsey and Tawfick debated admirably in what was an interesting and exciting evening, with many different schools competing. Whilst they were not one of the teams to make it into the final, they demonstrated all the qualities of good debating: cogent argumentation, clear delivery and the ability to think on one’s feet. This year’s Young Enterprise team, Illuminate, welcomed Becky Nicholson from the children’s hospice, Martin House, to help them with their idea. In a first for Ampleforth, the team has decided to run as a Social Enterprise rather than as a company. They have been busy fundraising in school selling their handmade lavender bags and scented candles and sold their products to the general public at Asda in York this weekend. With the proceeds of their various fundraising activities, they are putting together bereavement boxes to be gifted to the siblings of children who have passed away at Martin House. The contents of the boxes will include craft activities to help the siblings remember their brother or sister, a soft toy, a prayer heart and finally a book that the team are writing themselves to provide a message of hope following the loss of a loved one. The team have worked sensitively so far on what is clearly a difficult concept and it has been a unique experience for our experienced Young a Enterprise link teacher, Mrs Stannard, given the purpose is not to create profit to share out at the end, as is usual, but to generate funds to give something to others in need. We wish them well with their endeavour and, of course, the Young Enterprise competition. Still on the this theme, OA Barnaby Wiener recently talked to some of our sixth formers about ‘Social Enterprise – Using the Power of Business to change the World’. With conviction, humour and quiet passion he delivered the message that ‘doing good’ and ‘making money’ need not be – indeed should not be – seen as separate boxes when young people consider what to do with their lives. Referring to his career as an investment fund manager, he explained how he promotes ethical investment, while his own Treebeard Trust invests in thirty different social enterprises, from a chocolate factory for people with autism to a construction company for ex-offenders. 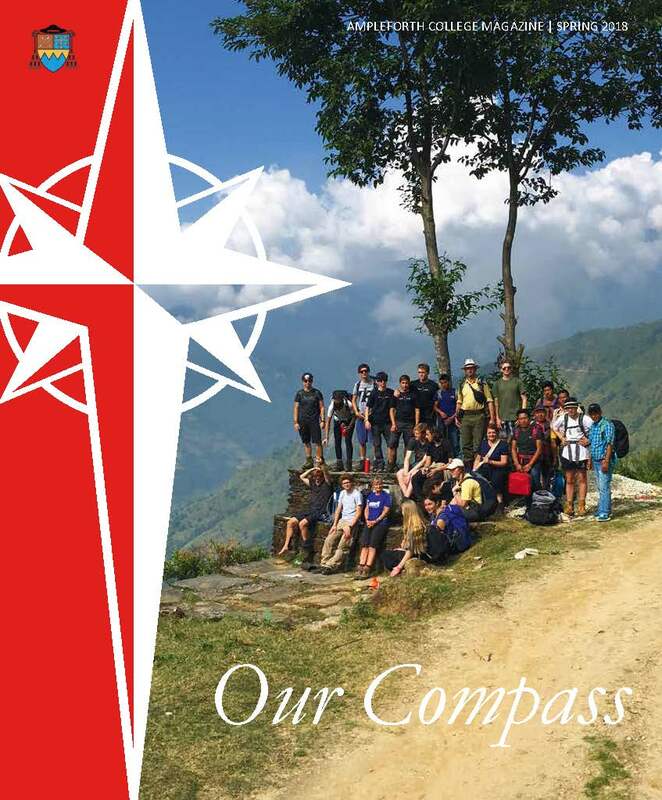 We’re proud of the many different careers paths chosen by our students, so many of which reflect the Compass for Life which they are given here at Ampleforth. Finally, good luck to our hockey girls, off to play in the semi-finals of the National Plate. They are hoping to go one step further than the boys’ 1st XV, who reached the semi-finals of their national competition before losing in the dying seconds of the game. We wish them a great match in Norwich!